I got an Altair Wave Series 80mm F6 Super ED Triplet APO telescope with recommended field flattener (The Altair Planostar 1.0x Field Flattener (PLANOS-2-1.0-80-F6-M48)). My issue is that I dont know how to attach the field flattener to the telescope. 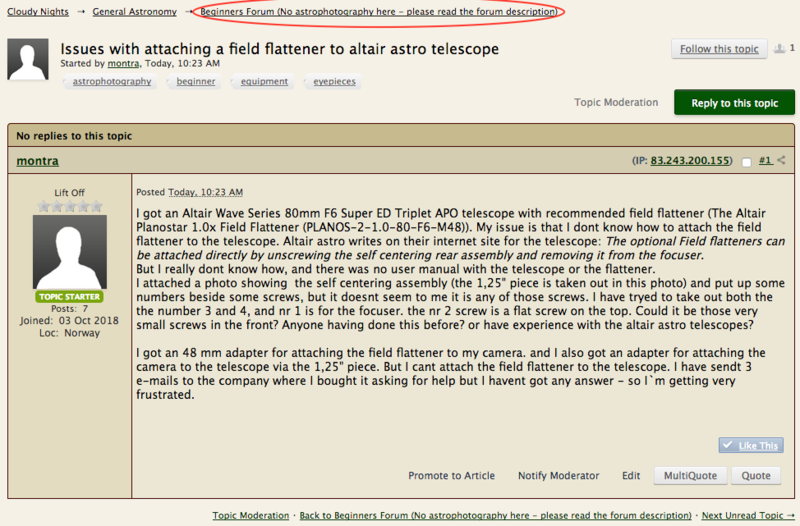 Altair astro writes on their internet site for the telescope: The optional Field flatteners can be attached directly by unscrewing the self centering rear assembly and removing it from the focuser. But I really dont know how, and there was no user manual with the telescope or the flattener. I attached a photo showing the self centering assembly (the 1,25" piece is taken out in this photo) and put up some numbers beside some screws, but it doesnt seem to me it is any of those screws. I have tryed to take out both the the number 3 and 4, and nr 1 is for the focuser. the nr 2 screw is a flat screw on the top. Could it be those very small screws in the front? Anyone having done this before? or have experience with the altair astro telescopes? I got an 48 mm adapter for attaching the field flattener to my camera. and I also got an adapter for attaching the camera to the telescope via the 1,25" piece. But I cant attach the field flattener to the telescope. I have sendt 3 e-mails to the company where I bought it asking for help but I havent got any answer - so I`m getting very frustrated. Please ask your AP-related question in the Beginning & Intermediate Imaging Forum.